While no two carports are entirely the same, it’s fair to say that more simple carports are the norm when it comes to projects for Mr Carports. However, we love to get stuck into something that’s a little more complex. So, if you’re after a Melbourne carport that’s a little out of the ordinary or more complicated than the average, Mr Carports is the team to call. Style elements can certainly result in a Melbourne carport that’s a little different and more complex. This can include a carport incorporating two or even more roof styles, for example a flat roof and a gable roof. This is sometimes done to add interest but can also be a necessity due to unusual angles between say the fence-line and the house. Style complexities can also be introduced with features such as a curved roof, which, while not overly complex to build, is certainly different. 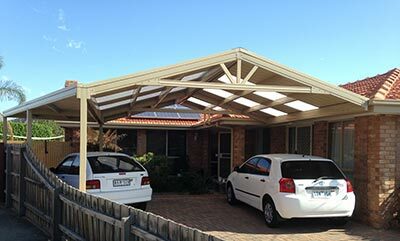 The location of your Melbourne carport can also lead to a more complex project. For example, perhaps your carport needs to be wedged between a fence and the house, you have a steep drive or other space issues. These types of problems call for some creative thinking, but generally can be overcome. Complexities can also be in what’s below the surface. For example, one of our branch members needed to build a double carport over sewer and stormwater drains, with 1.9 metre deep footings required. This called for very accurate positioning of the carport to cater for the drains, while still allowing access for two cars. It was a challenge, but a challenge that our people were able to meet. One of the ways to ensure a beautiful Melbourne carport is to match it with your home, but matching some items, such as period-style features, can often be tricky. Sometimes it’s the height of the carport that can be a little more complex. For example, rather than build a Melbourne carport against a house using the fascia for support, it can be better to raise the roof to provide more vertical space and ensure a strong support. While perhaps seeming complex, this can actually be done quite easily by using special steel brackets that connect to the roof of your house. Complex or simple, Mr Carports can help you build the carport of your dreams. Phone Mr Carports in Melbourne on 1800 557 782 and we’ll organise a time for a free discussion, carport design and quote.